GALLERY: 2018 Audi RS4 Avant - 450 hp C63S rival? Home » Cars » GALLERY: 2018 Audi RS4 Avant – 450 hp C63S rival? GALLERY: 2018 Audi RS4 Avant – 450 hp C63S rival? 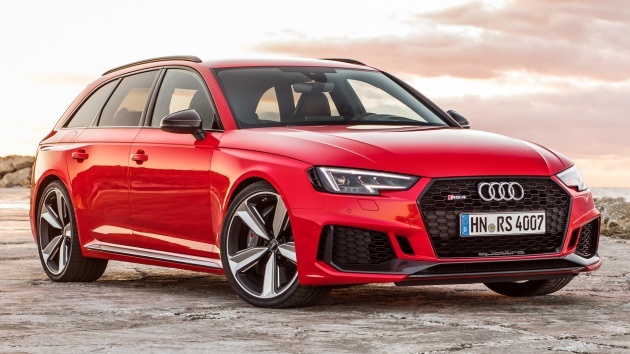 The all-new Audi RS4 Avant made its world debut a little over three months ago, continuing the station wagon tradition first popularised by the Audi RS2 in the mid 90s. Much has changed over the years, and like the RS5 coupé, the latest RS4 gets a new 2.9 litre twin-turbo V6. Adieu, big bore V8 goodness. The new motor produces 450 hp and 600 Nm of torque, channeling drive to all four wheels (quattro) through a new fast-shifting eight-speed conventional automatic transmission (previous models used a seven-speed dual-clutch auto). While power remains the same as before, torque is up by a whopping 170 Nm thanks to forced induction. This allows the wagon to sprint from zero to 100 km/h in 4.1 seconds before maxing out at an electronically-limited speed of 250 km/h. Opt for the RS dynamic pack and Vmax is raised to 280 km/h. Options include a rear sport differential, Dynamic Ride Control dampers to go with the RS sport suspension plus (up to 30 mm lower than standard a A4 without the sports suspension) as well as carbon ceramic brakes. Visually, the RS4 Avant gets dressed in RS-specific bodykit, gloss black honeycomb Singleframe grille and carbon-fibre trims, which is used on the lower front bumper, wing mirror caps and rear diffuser. The bulging wheel arch is 30 mm wider than a standard A4 Avant, within which rests a set of 20-inch alloy wheels shod with 275/30 Continental SportContact 6 tyres. Another key component to the RS identity is the dual oval exhaust pipes, finished in gloss black. Inside, the RS4 gets more carbon-fibre decorative trim panels, RS badging on the steering wheel, centre tunnel and on the seats. Buyers can choose to further personalise the cabin through Audi Exclusive, which offers a selection of seat materials and colours, ambient lighting and more. Liking what you see here? What do you think of the new RS4 Avant? Sound off in the comments section below. Come here RM1 Million becoz wealthy Malaysia we r. Poorer USA pay RM300k… Vavavooom Audi RS4! Looks amazing inside and out. Looks like a baby RS6. Then you floor the throttle and realise it’s a monster. Would love to have one of these as a daily driver. Too bad it lost the dual clutch gearbox in favour of a traditional automatic. But it’s so much smoother at slow speeds, so it’s forgiven.